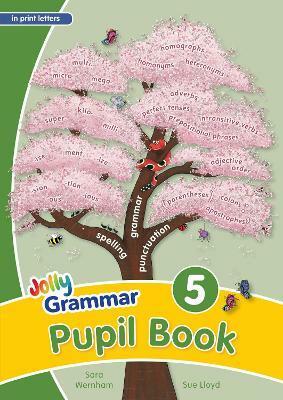 The Grammar 5 Pupil Book is designed specifically for use with the Grammar 5 Teacher’s Book. Together, they follow on from the Grammar 1-4 Pupil and Teacher’s Books and provide the next year of grammar, spelling and punctuation teaching. The spelling lessons in the Grammar 5 Pupil Book not only teach many new spelling patterns, but further extend the children’s knowledge of multisyllabic words. Regular activities ensure that the children are not only able to spell these words correctly, but also understand the words’ meanings and use them in context. In the grammar lessons, the children continue to refine and expand upon their existing knowledge: for example, by learning about homographs, homonyms and heteronyms. The children are also introduced to many new concepts, including transitive and intransitive verbs. In addition, the children build upon their knowledge of sentence structure by learning about sentence walls. All of this knowledge helps the children to bring clarity to their writing.